After nearly 20 years in the making, TxDOT, COSA, and South Texas Medical Center officials celebrated the completion of the Medical Drive underpass at Fredericksburg Road this morning with a ribbon-cutting ceremony and opened the new lanes to traffic a short time later. 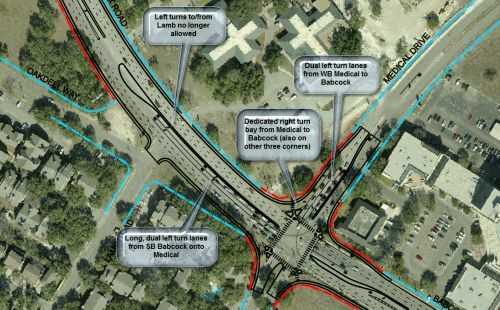 The nearly $15 million project was primarily done for safety, namely allowing ambulances quicker access to the Medical Center from I-10, bypassing the oft-congested Fredericksburg/Medical intersection. As if on cue, the wailing siren from an emergency vehicle trying to navigate the intersection above interrupted the ceremony. After the ribbon was cut, an ambulance and EMS squad truck were the first vehicles to “officially” use the underpass. Long, dual left turn lanes from southbound Babcock onto Medical. This will facilitate the morning commute and help reduce the backups on Babcock that sometimes extend nearly to Hamilton Wolfe. Dual left turn lanes from westbound Medical to southbound Babcock. To facilitate the new long left turn lanes on southbound Babcock, left turns to and from Lamb Road will now be prohibited. I know a lot of people use that to get to/from Oakdell Way– those folks will now either have to use Medical and come back around from the west or use Roanoke Run or Hamilton Wolfe to the north. I was actually a little surprised that the plan did not completely close the Lamb Road intersection with Babcock and instead realign Oakdell Way through the empty lots there to meet Babcock at a new intersection about 150 yards or so to the north. Another small surprise was that the wide median on Medical on the west side of Babcock wasn’t narrowed, maybe for a dedicated left turn lane. I often see people coming from that direction turning left onto Babcock interfere with oncoming traffic going straight or turning right and I’m convinced that the wide median there is part of the problem. Reconfiguring that median or changing the signals to a split-phase would resolve that. Thanks to the folks at the South Texas Medical Center Alliance, Project Control, and Pape-Dawson Engineering for making the plans available to me.